When hospital patients fall, it’s usually when they’re getting in or out of bed. Each fall that results in injury costs an average of $14,000, according to a recent study published in the Journal of Medical Internet Research. Wi-Fi and the Internet of Things (IoT) enable hospitals to minimize bed fall risk. The study used a pressure-sensitive mattress pad that detects movement and then uses an algorithm to analyze whether that type of movement predicts means the patient is likely to get out of bed. “By using an alerting system that sends notifications directly to nurses’ mobile devices, nurses can equally respond to unassisted bed-exit attempts wherever patients are located on the ward,” the study says. The study is the latest example of why hospitals need fast, reliable, seamless, secure Wi-Fi. And not just any Wi-Fi solution will do. The WLAN must blanket every patient room, nurse station, hallway and elevator to maximize the effectiveness of bed-fall-monitoring solutions. The WLAN also must be able to provide reliable connections even when the RF environment is constantly changing, such as when patients’ and visitors’ personal Wi-Fi devices create interference. In fact, IoT itself has a snowball effect. The analyst firm IDC says “IoT could multiply the number of network endpoints in a health care institution by a factor of 10.” More devices mean more interference, which undermines speed and reliability for every device on that WLAN, IoT or not. 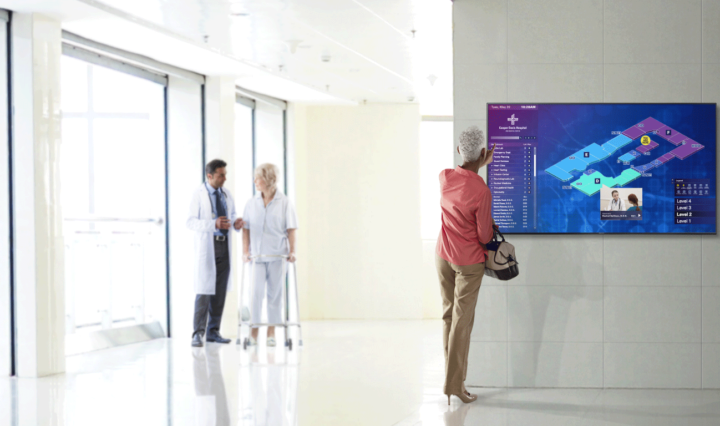 Samsung’s WLAN solutions enable hospitals to avoid those problems and leverage IoT to maximize patient care and staff productivity. For example, each Samsung access point (AP) has 15 antennas: three for monitoring, and 12 that optimize their signal beam based on the environment. Known as Intelligent Beam Selectable Antenna, this feature minimizes dead zones, extends service coverage and has a receiving sensitivity 2 dB higher than competing APs. Hospitals aren’t the only health care facilities that need great Wi-Fi. Thanks to trends such as insurance providers encouraging policyholders to choose outpatient care, many hospitals are buying or building ambulatory facilities, a broad category that includes everything from urgent care to knee surgery to dialysis. Ambulatory facilities have many of the same challenges and needs as hospitals, such as preventing bed falls and giving clinicians tablets so they always each patient’s electronic health records at their fingertips. That’s why savvy health care providers are applying the lessons learned from their hospital WLANs to their ambulatory facilities, starting with choosing a Wi-Fi solution that’s capable of providing fast, reliable, seamless, secure service. Ambulatory facilities have some additional, unique considerations that affect Wi-Fi. For example, many walk-in clinics are in leased spaces, such as strip malls, where they’re surrounded by other tenants’ WLANs. Samsung APs have features such as spectrum analyzers to identify signals from neighboring tenants and shift traffic to clear channels. Samsung APs also work with one another to ensure that they’re all on the right radio channels to minimize intra-WLAN interference. Finally, although ambulatory clinics get their name from how patients come in on their feet rather than a stretcher, they often don’t come in alone. So it’s important that the WLAN has enough coverage and capacity to support not only internal applications, but also the Wi-Fi devices that patients’ friends or family bring to pass the time during procedures and recovery. Samsung APs use techniques such as intelligent beamforming to accommodate the changing traffic patterns that result. For example, as the waiting room loads with Wi-Fi devices, the APs serving that area can choose the antenna patterns and channels that provide guests with the right amount of speed and coverage without compromising service for internal applications. Guest devices also are a potential security risk. Samsung APs mitigate that risk with a dedicated chip for continuous real-time security monitoring, which helps the facility comply with HIPAA and other privacy laws. This approach reduces the amount of standalone security equipment that the facility needs, helping keep the total WLAN system cost within budget—a benefit every health care provider can appreciate.